Nowadays, materials and process engineering, especially digital-based techniques, are becoming more and more important for esthetic dentistry. Digital communication is also increasing, which is accompanied by a change from a personal contact to a more technocratic and less emotional and empathic communication. Sometimes our personal experiences and perceptions, based on dental, empirical knowledge, collide with this development. It also happens very often, that the patients - with their perceptions, concerns and not least their esthetic preferences - feel neglected by the treatment team. Patient's wishes often cannot be described adequately. 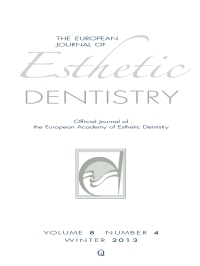 The patient-supported esthetic protocol (PEP) described in this article is a simple tool with which the patients are involved in the esthetic concerns of their treatment. The patient feels to be more perceived, respected, and their wishes implemented, without affecting the medical therapy. At the same time, PEP is used for communication within the health care team, such as the dentist and the dental technician. Because of the clear record it is easy to recognize the changes the patient desires, and the suggestions a teammate developed with the patient, without having been present at the session. Furthermore, the protocol can be attached to the patient's medical history and, therefore, could be a tool for quality management. In case of severe dental erosion, the maxillary anterior teeth are often particularly affected. Restoring such teeth conventionally (ie, crowns) would frequently involve elective endodontic therapy and major additional loss of tooth structure. A novel, minimally invasive approach to restore eroded teeth has been developed and is currently being tested in the form of a prospective clinical trial, termed The Geneva Erosion Study. To avoid crowns, two separate veneers with different paths of insertion have been used to restore the affected anterior maxillary teeth, regardless of clinical crown length and amount of remaining enamel. This treatment is called The Sandwich Approach. Objectives: The purpose of this case series study was to analyze the mid-term clinical outcome of maxillary anterior teeth affected by severe dental erosion that were restored following the Sandwich Approach. Materials and methods: Twelve consecutively consulting patients (mean age: 39.4 years) suffering from advanced dental erosion have been enrolled in the study and were subsequently treated. Due to the late interception of the disease, all patients needed a full-mouth rehabilitation, which was performed without any conventional crowns. At the level of the maxillary anterior teeth, a total of 70 palatal indirect composite restorations and 64 facial feldspathic ceramic veneers were delivered. Both types of veneers were adhesively luted with a hybrid composite. Clinical reevaluations were performed 6 months after insertion of the veneers, and then annually, using modified United States Public Health Service (USPHS) criteria. Marginal adaptation, marginal integrity (seal, absence of infiltration), status of pulp vitality, postoperative sensitivity, esthetics, and restoration success/failure, were the principal clinical parameters analyzed. Results: After an up to 6-year observation time (mean observation time 50.3 months for the palatal veneers and 49.6 months for the facial veneers), no complete or major failure of the restorations was encountered. On the basis of the criteria used, most of the veneers rated Alpha for marginal adaptation and marginal seal. Secondary caries or endodontic complications were not detected. Using visual analogue scale analysis, the patient-centered satisfaction revealed a high esthetic and functional acceptance of 94.6%. Conclusions: Compared to conventional crown preparation, restoring compromised maxillary anterior teeth by means of 2 veneers prevents excessive tooth structure removal and loss of tooth vitality. Questions on the longevity of this new treatment arise, due to the nonfavorable initial status of the teeth to be restored (eg, lack of enamel, sclerotic dentin substrate and short clinical crowns). The clinical performance of the teeth treated following the Sandwich Approach seems promising, since none of the treated teeth lost their vitality, no failure of any of the restorations was detected, and the patients' overall satisfaction was high. Even though further investigation is needed to determine the clinical long-term performance of the described treatment modality, the encouraging mid-term results (biological, esthetic, and mechanical success) clearly question if conventional crowns in the anterior maxillary segments can still continue to be considered the best and only option to treat this particular population of patients. Purpose: The purpose of this study was to evaluate the esthetic result of monophasic zirconium dental implants, placed in the highly esthetic areas of the jaws. Material and Methods: In this case series the results of 12 monophasic zirconium dental implants placed in highly esthetic areas of 8 patients (6 male and 2 female). For each implant the Pink Esthetic Score (PES) and the White Esthetic Score (WES) were evaluated. All implants were inserted in fresh postextraction sites. Results: The esthetic parameters PES/ WES has given a total average value of 15.5 ± 1.5. Analyzing the two indices individually, the PES has given a value equal to 7.5 ± 1 and the WES has given a value equal to 8 ± 1.13. Both values obtained indicate the achievement of an absolutely satisfactory esthetic result. Conclusion: Within the limits of this study, the zirconium dental implants seems to give excellent results with regard to the esthetic result and for the maintenance of peri-implant soft tissues. Tripodakis, Aris Petros D. / Gousias, Herakles C. / Andritsakis, Panagiotis D. / Tripodaki, Eirini A. Background: The need for proper framework support for the veneer porcelain in fixed partial dentures (FPDs) has been well documented. The aim of this study was to compare the variations of the support provided by frameworks designed directly on the computer, or indirectly through scanning a wax pattern. Materials and Methods: For each of the six upper anterior FPDs that were involved in the study, prior to milling one framework was designed conventionally in wax and scanned and another one was directly digitally designed. The restorations consisted of full coverage retainers and pontics on natural abutment teeth and implant abutments at random. The produced frameworks were evaluated regarding the incisal support they would provide to the veneer material, as this was revealed by a silicon key representing the outer labial contour of the provisional restoration. The distances between the distal and mesial incisaledges and the corresponding negative incisal contour of the key were measured with a digital caliper. Statistical analysis was performed by linear regression with the design method, abutment type and pontic type as independent parameters (a = 0.05). Results: The values recorded were: means ± SD: 3.3 ± (direct CAD), 2.6 ± mm (indirect CAD) 2.7 ± mm (for retainers on natural teeth) 2.7 (on implant abutments), and 3.3 mm (for pontics). Linear regression analysis showed that the indirect technique provided more intimate incisal support for the ceramic veneer on a statistically significant level and even more so in the pontic areas. Objectives: To our knowledge, there is no study regarding the effects of facial type (short face or long face) on the esthetic perception of smiles as related to the amount of tooth and gingival display. Materials and methods: Four photographs from two long- and two shortfaced females with posed smiles were prepared and, with altering the amount of tooth display, 5 photos for each of them were produced. These photos were given to 62 dentists and 69 laypersons to rate the images. Results: There were significant differences between short and long-face patterns in low and high smile lines; also there were significant differences between dentists and laypersons about some images. Smile lines consistent with gingival margin were the best for both short and long-face patterns; also 1.5 mm incisor coverage in short-face and 1.5 mm gingival display in long-face received as high scores. Conclusion: In short-face patterns, lower smile lines, and in long-face patterns, higher smile lines are more acceptable by both dentists and laypersons, which can help in designing orthodontic treatment goals. As the demand for an esthetically satisfactory smile has increased, interest in less invasive procedures, such as composite restoration and tooth bleaching, has also increased. Composite resins exhibit several optical properties, including fluorescence, which are intended to mimic the natural dentition. The aim of this study was to evaluate the effect of hydrogen peroxide (HP) bleaching protocols for home and in-office applications on the fluorescence of composite resins. Sixty composite resin specimens (shade A2) were divided into 2 groups of 30 each according to the material type (groups R1 and R2 were made up of 4 Seasons and Opallis specimens, respectively). Each group was subdivided into 3 subgroups (n = 10) according to the bleaching protocol administered: home application (HP 7.5%); in-office application (HP 35%); and control (Co), immersion in deionised water. The fluorescence intensities were measured before and after the bleaching treatments using a Cary Eclipse fluorescence spectrophotometer and statistically analysed by paired t test, Student's t test, analysis of variance (ANOVA), and Tukey's multiple comparison test (P < 0.05). Significant differences between groups R1 and R2 after the different treatments were noted. The fluorescence intensities differed across the subgroups after 30 days of treatment. The HP 7.5% protocol induced the greatest change in the fluorescence intensities among the specimens in the R1 group.